Edition: V Praze : Český spisovatel, 1993. Petr Rákos (1925–2002) was the former consultant of the Psychiatric Hospital Bohnice in Prague, founder and head physician of the Bohnice Crisis Centre and also a keen writer. He wrote and translated professional and popular science articles in magazines and newspapers as well as cooperating in TV and radio. His most famous book is Corvinus or the Book of Ravens. It is thrilling, charming, playful, surprising, enlightening and original prose. 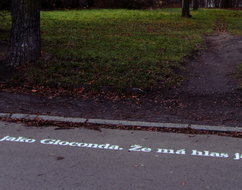 The trail is located at the Psychiatric Hospital Bohnice, where the public has free access.The literary trail offers delight for both visitors and hospital staff and patients.